The Palm Tree tree. Yep, she’s even got one of those. Patty has a friend from Hawaii who sends her ornaments, so of course she’s got a tree especially for them. If you’ve been to the Keller Convention Center in Effingham, IL anytime in the past, oh, 28 years then you’ve probably seen Patty Greene. She’s the one booking it around the place in heels, a skirt and beautiful hair-commercial hair. It’s so bouncy and soft-looking, you can’t miss her. Originally from Springfield, IL she met her husband, Troy, while at Eastern Illinois University where she invited him to a sorority formal and they hit it off. What got her the job at Keller was experience in organizing parties for politicians, which is what she was doing when she became engaged to Troy and was making the move to Effingham. (Ask her about the T-Town church picnics she and her family attended as guests of Chuck Hartke back in the day.) Doris Keller hired her on the spot. She’s been organizing events at the place ever since. If you’ve been to the Convention Center at Christmastime, then you understand the extent to which they decorate for Christmas. It’s quite something. Like displays in which you could climb up in and take a selfie with a cherub. As with every time I see an elaborate Christmas display I have to wonder who’s the poor soul who has to put it all up and take it down (the worst) and where do they store it all? Don’t worry that’s not Patty’s job but the whole decorating for Christmas thing has rubbed off on her over the past couple of decades. That’s how she’s ended up with no fewer than eight (8!) decorated Christmas trees in her home. That and an after-Christmas-sales-shopping-for-decorations ritual she’s had with her mom since before she got married. Her favorite spots in Springfield, IL to hit are Homescapes and JB Interiors and then lunch at Lake Pointe Grill. This is Patty's Swarovski tree - her favorite. The tree is laden with beautiful Swarovski ornaments she's been given over the years. After Tytia and I took a minute to absorb the beautiful Christmas explosion around us Patty began the tour of her home with her favorite tree, The Swarovski Tree. Every year Swarovski releases a new ornament that is only available for a limited time and Patty has been getting them for her birthday and Christmas for a number of years. Hence the tree dedicated to them. Among her trees Patty also has a large Department 56 village set up. This is a collection ten years in the making. So much to look at and watch in this Department 56 village. The tiny little train goes round and round the depot. As you walk through the house you'll encounter the most colorful room of all - The Candy Cane Room. She splashes out beyond the tree to have this theme encompass an entire room. Lots and lots of red. In the past this room contained her Grinch Tree and she does plan to do that one again. Patty found the framed Dr. Seuss print at Fresh Digs. I think this might be my fave tree. But I am extremely partial to red. Everything on this tree came from the Department 56 store in Las Vegas. As if the Swarovski Tree isn’t glam enough, Patty also has a Waterford tree. It contains, among others, the gorgeous Time Square ornament which is no longer available. This tree morphs into her New Year’s Eve tree when she adds party hats and horns to it after Christmas. The Waterford Tree. This one sits proudly in her front window and contains Waterford ornaments. I had to share this. Check what happens when the sun comes out and the light hits the crystals. Little fairy lights dance on the wall. I present to you The Gold Tree. The Gold Tree contains, in addition to gold ornaments and feathers, this little gold shoe of Connor's when he was a preschooler. Be still my heart. The Gold Tree resides in the dining room with Patty's favorite thing in her home - her buffet. These are the chairs that she transformed from restaurant dining chairs to these magazine-worthy numbers. This tree is aptly named “The Gold Tree”. On it she has some Swarovski ornaments but also ornaments with sentimental value like Connor’s preschool shoe. He’s now 19 years old. I think we’ve all got an ornament like this that brings tears to our eyes when we pull it out of the box each year. We both stood there tearful when she read it aloud. Moms! Patty’s dining room chairs also hold sentimental value. Years ago the chairs themselves came from the dining room at the Ramada Inn and with inheritance money from her departed grandma she had the stain removed and then pickled the wood and had them recovered. They fit perfectly into her home AND are meaningful. The U of I Tree is in the basement ready for the Braggin' Rights game. She’s even got a sports themed tree in the basement. Her University of Illinois tree is just that – a tree devoted to all things U of I. Their son, Connor, attends the school and every year they hold a Braggin' Rights game party. And scattered throughout her house she's put loads of garland, ornaments and smaller trees. Look at how a few simple things like a large glass jar filled with ornaments and topped off with a little greenery really creates a festive statement. Don't have a lot of decorating space or perhaps you're low on storage space but want to do something? Try Patty's trick of filling a glass jar with ornaments. Simple and striking. And garland. Something as simple as garland with lights and ornaments packs quite a punch. She changes out the layout above the cabinets in her kitchen four times a year. When it’s not Christmas, Easter or Halloween palm trees reside in this space. To the left behind the couch is her little forest and up above in the cut-out is a tiny little door through which she enters to decorate. Mind blown. Walk into the Greene home and you walk into a peaceful and serene Christmas wonderland. There's something to look at at every turn yet it's not overwhelming. 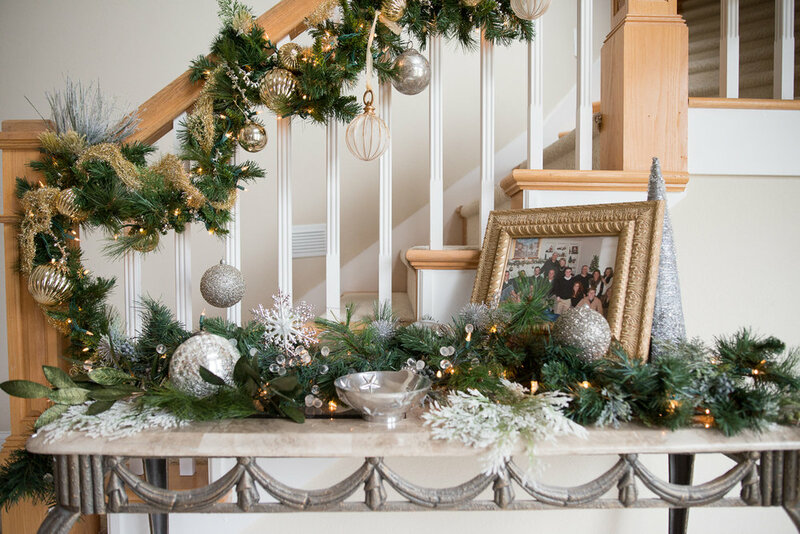 The Greene home is tastefully awash in the Christmas spirit with wonderful memories of year's past in every corner. We hope this home inspires you to do a little more decorating this year! Even the bathroom has Christmas cheer. She was given the Jan VonBokel Christmas tree painting and worked it into her dresser decor.